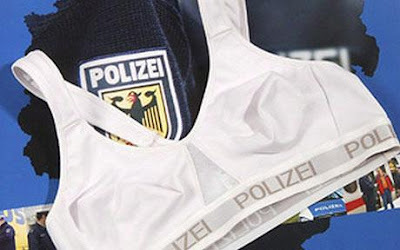 Here is the innovation in police woman fashion, especially underwear, that is bullet proof bra for police woman in Germany. How can it be? This innovation should be completed because the recent bullet proof dress usually used is still has a risk for woman. If there is a clash between bullet and bullet proof dress so the pressure of it will make the plastic or metal material in common bra will injure the part of body in which get touch with this material. This bra is called as 'Action Brassiere', made from material such as cotton, polyester, and several of syntesis material that are condensed without plastic or metal materials as the string of bra. The removable of the plastic and metal materials make the police woman get brave and self confidence in facing the criminals with firearm. This bullet proof bra can be used to substitute the bullet proof coat in which is weight and will disturb the mobile of police woman to protect the certain part of the body.